Dust … dust and MORE DUST. 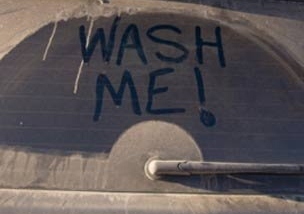 It’s that time of year when there is dust, pollen dust and more dust… EVERYWHERE! Seconds after you dust, there’s DUST! Makes you sneeze, makes your head hurt, makes your eyes water. Itty, bitty, tiny particles that are too small to do anything on their own, but let them get together and you’re dust. The good news is there is not going to be any dust in Heaven. There will not be any housecleaning, spring cleaning … sinus headaches or allergy attacks. Dust. Such a nuisance. But, we ARE dust. Dust and water on a skeleton frame. (Of course, sometimes we wish there was a little less dust and water on our particular frame). Wonder if God thinks of us as a nuisance sometimes? He made us from nothing. From “nuisance” to man. (And sometimes to “nuisance” again?) Amazing how God looked down on the earth, took the dust and breathed life into man. He made us valuable in His sight from dust. These bodies we value so much … we decorate with clothing and jewelry. We tan them, exercise them and yet is that what part of us is valuable? The things we put on ourselves? The things we collect? I wonder what would happen if we “dusted off” our spiritual “body” … exercised it, exposed it to the Son, clothed it in righteousness, purity and honor? This entry was posted in Mom2Mom and tagged Bible, Christian parenting, dust, Heven, Wash Me. Bookmark the permalink. ← How did we get there from here?